Normally, injuries are never something that you want to see for a team. Losing players for a significant amount of time during the regular season can come at the price of wins, but injuries during the preseason can often cause harm as well, as it is makes it harder for the team to create chemistry and for the coach to assess talent. Even though preseason is barely underway for the Dallas Stars, two players are already watching from the sidelines, and will be stuck there until the start of the regular season. 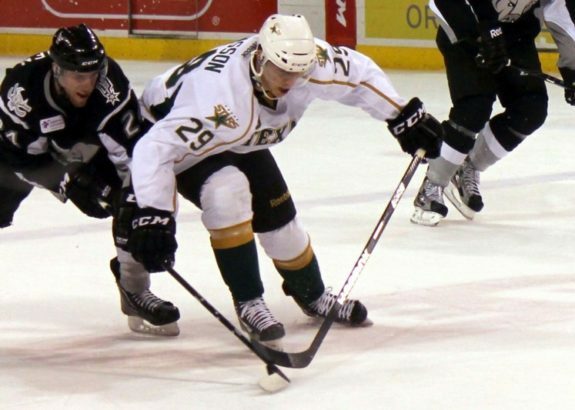 Defenceman Aaron Rome had a procedure done on his hip because of a preexisting injury, while newly-acquired Rich Peverley will have to wait to participate in game action with his new teammates due to a recent procedure to correct an irregular heartbeat. The good news is that both injuries aren’t serious and that both players should be fully ready to go not long into the season, but the real silver lining is that this temporary roster space opens up room for more intense competition between a number of the organization’s top prospects that are vying for NHL jobs. The Stars were a young team last year and will surely be young again this year, with a small handful of spots open at both forward and defense. 18 year-old winger Valeri Nichushkin, the 10th overall draft pick from June’s NHL Entry Draft, was very impressive in both the Traverse City Prospects Tournament as well as in training camp, and is being tried out on the top lines so far during preseason. He scored twice in Dallas’ preseason opener versus the St. Louis Blues, and had nine shots. The 6’4″ Russian is already heavily expected to make the Stars’ opening night roster, but isn’t guaranteed a spot in the Top 6 unless he continues to impress. Another favourite for one of the forward spots is right wing Alex Chiasson, who burst onto the scene last year with six goals and one assist in a seven-game tryout at the end of the year, forming strong chemistry with veteran Ray Whitney. Chiasson has bounced up and down the Stars’ lineup during the preseason thus far, as well as playing on both the top powerplay unit and on the penalty kill. Chiasson is practically a lock to make the Stars this season, but because of his strong two-way play is being tried out in a variety of different roles to find out where he fits best. Colton Sceviour, Scott Glennie, Brett Ritchie, Lane MacDermid, Luke Gazdic and others are also all in the running for one or two remaining depth spots at forward. The biggest competition in camp, however, is on the blueline. The Stars have six defencemen that are locks for spots on the roster: Alex Goligoski, Sergei Gonchar, Trevor Daley, Stephane Robidas, Brenden Dillon and the injured Rome. That leaves one spot open for sure as the 7th, but there has also been a lot of talk about the Stars carrying eight defencemen going forward. Jordie Benn, 26, and Jamie Oleksiak, 20, both dressed for the Stars last year, but struggled more than succeeded. Kevin Connauton has yet to dress for his first regular season NHL game, but is a highly regarded prospect, and scored a goal in the game against the Blues. The competition between the three is neck-and-neck-and-neck. Cameron Gaunce and Patrik Nemeth are longshots, but could raise their stocks with strong individual performances. With two preseason games down and five more to go, the competition is only just starting to heat up.